Style meets substance in the Lexi Brushed Steel Stool Grey, a highly practical design with an elegantly understated aesthetic. Offering a luxurious touch to your bar area, the Lexi will work wonders with its simple yet sophisticated appearance. Covered with versatile grey faux leather, it is the perfect accompaniment to any space, lending a cool contemporary edge wherever it is placed. The seat features a supportive mid-height square backrest, filled with comfortable high-density foam padding. Hand-brushed, the one-column frame enhances the minimalist look of this piece. 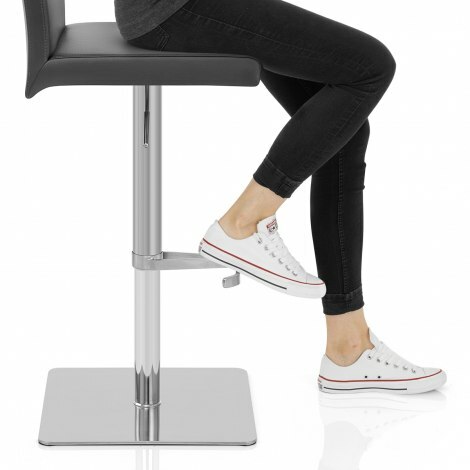 Plus, it features a gas-lift for variable height, as well as 360-degree swivel function to allow you to easily dismount from your stool. For additional support, a uniquely curved T-bar footrest is included. The Lexi stands on a flat, square base which keeps the entire model stable, with felt pads beneath to help to protect floors. "These stools are excellent quality, comfort and style"
The stools are really good quality and gave a lovely heavy base so that they do not tip over. They are very stylish and are a perfect in my kitchen. These stools are excellent quality, comfort and style. They're not cheap but they represent very good value for money due to their quality of build.